Octopus BrainStorming art installation at Speculum Artium in Slovenia. 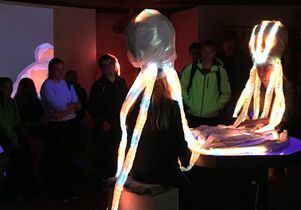 Welcome to “Octopus BrainStorming,” a participatory performance art installation that combines the technology of neuroscience with an artistic interpretation of the type of communication exhibited by octopi. “I have always been fascinated with the octopus as the most complex animal that is the most distant common ancestor to humans. Their intelligence is fascinating and I find it important to connect to these aliens in our midst and appreciate another type of consciousness,” said Victoria Vesna, UCLA professor of design media arts and director of the UCLA ArtSci Center. Vesna created the project over five years with UCLA neuroscientist Mark Cohen, a pioneer of the use of magnetic resonance imaging to study human cognition. In “Octopus BrainStorming,” which debuted at the opening of UCLA’s Luskin Conference Center in October 2016, Vesna and Cohen are trying to show the power of non-verbal communication using live performance. Vesna said she was inspired by octopi when she learned about their full-bodied consciousness. Growing evidence indicates that cephalopods exhibit higher intelligence and are potentially fully conscious beings — traits that previously were thought to be exclusively human. What fascinates scientists and individuals such as Vesna and Cohen are differences between human neural circuits and cephalopod neural circuits that result from thousands of years of divergent evolution and demonstrate that conscience communication can occur through means other than talking. Octopi and their kin are the only example outside of vertebrates that have complex clever brains. This summer while “Octopus BrainStorming” was at the Speculum Artium festival in Slovenia, Vesna and Cohen transformed a mining cave into an immersive world of lights and sounds that seemed like something out of a sci-fi film. When it was time for the conversation, two people sat at a table raised on a platform while an audience gathered to witness their wordless conversation. Two octopus crowns sat atop the participants’ heads. Vesna designed the crowns to glow from within, including illuminated tentacles that drape down around the participants. The light came from 350 LEDs of varying colors that danced around the rainbow throughout each conversation. To add to the deep sea ambience, images of swirling octopi were projected onto a screen above. Vesna said that octopi express themselves not in language but in their ability to change shape and color; this morphing process has been called “post-symbolic communication.” Capturing emotion in lights and sounds allows for the humans involved in this presentation to experience full-body communication unlike anything our species is capable of. Premiere of Octopus BrainStorming at the UCLA Luskin Conference Center, October 2016. Art|Sci Center on Vimeo. Participants are instructed not to think about anything in particular but rather to feel their emotions and empathize with the emotions that are being expressed by their partner’s headpiece. 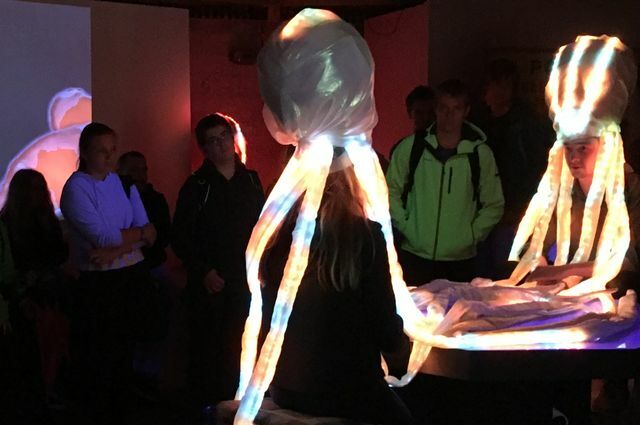 To generate the visual expressions of emotions, the octopus headpieces are equipped with EEG recording devices. Throughout the presentation, the participants’ brainwaves are run through a unique set of algorithms designed by Cohen that translate the brainwaves into lights and sounds. Eight parameters — each of which is a measure of the similarity of the two participants’ brain signals — are used to control the LED lights on the headpieces and the eight voice recordings emitted from speakers around the room. 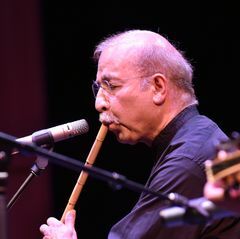 The vocal element was created by singer Kenton Chen who composed the piece using recordings of his own voice that can be mixed to create varying textures and rhythms, adding to the unearthly environment. Each color is connected to a recorded acapella tone, all of which is under control of the participants’ EEG, Cohen said. What results is a concert of tones and lights unique to the participants that have been chosen for the day. Vesna and Cohen hope that their presentation will urge the audience and participants to leave their preconceptions about communication behind. 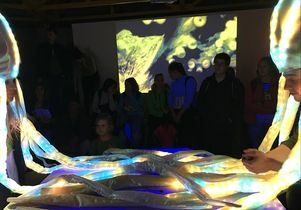 “I could go on and on about the many reasons that I am interested in the octopus, but in the context of the project, it is the embodied intelligence that is particularly fascinating to enact — brainstorming with the entire body rather than in a centralized, anthropocentric manner we are thought to think,” Vesna said. The next performance of “Octopus BrainStorming” will be Nov. 16 in Santa Monica as part of Building Bridges Art Exchange, SYN CITY. The event, which is free and open to the public, melds creative expression with scientific inquiry, inviting the audience to experience perception through sculpture, performance, interactive installation, photography and visual art. Octopus BrainStorming art installation at Speculum Artium in Slovenia in summer 2017.